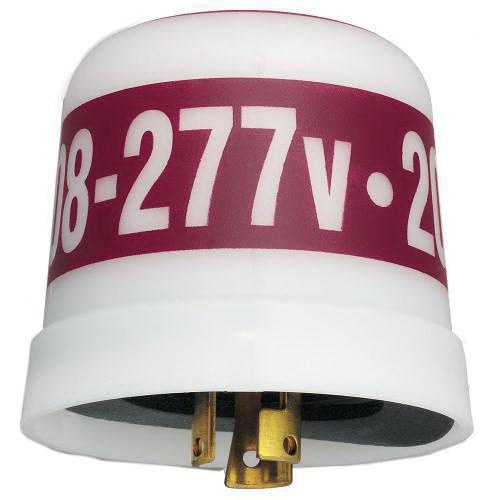 Intermatic Thermal locking type photocontrol in white with maroon band color, has current rating of 8.3-Amps/15-Amps and voltage rating of 208 - 277-Volt AC. This photocontrol has 3120 - 4155-Watt tungsten and 1700 - 2300 VA ballast. This photocontrol features integral high-impact polypropylene housing. It measures 2.75-Inch x 3-Inch Dia. Locking type photocontrol has 3-prong twist and locking-type plug connection. This dusk to dawn setting photocontrol has 30 - 90 sec time delay to prevent unwanted OFF switching. Photocontrol features SPST contact configuration and supports lock mounting. It is suitable for exterior lighting, street lighting, parking lot, pedestrian pathway and landscape lighting. This photocontrol withstands temperature rating of -20 to 104 deg F. Photocontrol is UL listed, CSA certified and meets ANSI C136.1 standards.